My Grandmother is 87 years-old and she is a phenomenon. She keeps up with, has an opinion on, and speaks eloquently on everything from football to politics. It is really amazing to have a conversation with her. Recently, I asked her to have lunch with me so I could pick her brain about her long and full life. What she shared reinforced my high opinion of her. I hope to use it in my daily life, feel free to do with it what you will. She was an 18 years-old girl with a baby barely over two weeks and her husband had already been drafted into the US Army. Seems normal enough "in those times", I guess, until her 22 year-old husband's plane goes down in a crash that kills him immediately. His name was Ken Alexander and he never saw his new baby boy; Grandmama remembers her young husband fondly. A man with a lot of friends whom everyone liked with a good disposition. A new father, smart and attractive. Thankfully, that event alone was enough to shape a person, but certainly not break a person, at least not her. In my mind, this was probably where she became the strong force of a woman that I have always known her to be. Mom, Mary Louise, Mary, Grandmama, HoneyGram, Mona, Honey, and Grandma are her titles and she has held them all with strength and grace and still does to this day! I thought it so interesting that one of the things she is most proud of is the melding of families over the years of her children's spouses. She has four children and the building of the extended family has always been a priority for her. She said of having children, "I don't know what my life would be without them." 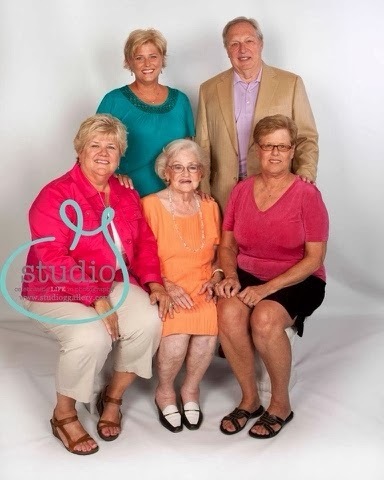 Dad, Jane, Ann, and Sally are very fortunate indeed. Grandmama worked outside the home while she was having children and loved working. She loved to feel valued in a job and enjoyed different roles in event planning. She still has a name plate displayed in her apartment that says Mary Davis, Social Chairperson. I love that! She is the first to admit that she was able to work because she had help. Get this, Grandmama's mother and aunt lived with her and my Grandfather- her Aunt Edie for 18 years! They had 8 people in one house, six women, two men-1 bathroom! And, of course, there's Papaw. My grandfather was everything to all who knew him. A teacher, a coach, a father, a grandfather-and so much more-that was Don Davis. I thought it telling when I asked Grandmama what her best advice would be and she said-"It is really important who you marry." Easy for her to say, she married Papaw and hit the jackpot! She described him as selfless, putting everyone above himself. They were married for 56 years. Papaw died on January 14, 2002, it was one of the saddest days of my life. And that it just occurred to me that today is also January 14, which brings my heart an overwhelming sense of both joy and sadness. Grandmama remembered something Papaw would say to his children, "Remember who you are." What we say as parents now, "don't do anything stupid and embarrass me!" I like his version better. As a coach, when a kid would make a mistake and start making excuses and comment, "but I thought", Papaw would come back with, "That's your problem, you think too much." I can just picture him saying that. He never had malice or meanness in his voice- but he could be matter-of-fact. Papaw was pure love, commitment, honesty, fun, and family. And I must mention the chalkboard in Grandmama's kitchen that reads, "I love you," which Papaw wrote to her which has never been erased, and whenever I see it; I am reminded of what a gift he was. I relished in hearing my Grandmother speak of him exactly as I had remembered. Even though these are just a few nuggets from Grandmama's rich life, I hope to learn more from her in the days to come. I understand that a blog posting could never do justice to all of the experiences and accomplishments that have happened over 8 decades, but even a small part of her long life is worth sharing.